Update May 9: The Zenfone 3 Zoom is now available to buy for $329 USD. Check out full details here. In fighting terms, there is an expression of “no contest”. A whipping. A drubbing. 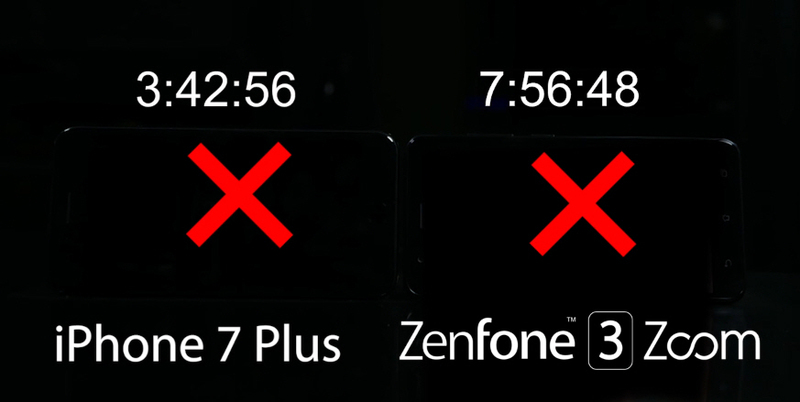 Choose your phrase or your terms for a no contest because that’s what the Zenfone 3 Zoom vs. iPhone 7 Plus battery comparisons prove. It’s not close folks! We pay a lot for our mobile phones. We should expect a lot from them. Battery life has long been a source of irritation. Have companies dealt with battery life woes? Some have but most haven’t. Asus stepped up with the Zenfone Max series which set out to provide a battery life experience that was far above and beyond consumers expectations. So when Asus showed the 5,000mAh battery inside the Zenfone 3 Zoom, it was eye opening. However I do not think that the amount of coverage was quite up to the level it should have been at. Perhaps this new video comparison by Asus will help educate people on just how impressive the battery life is on the Zenfone 3 Zoom. In the video, Asus left the most shocking test result to last. I don’t think they should have done that. The video playback battery life test should have been right at the start of the video to ensure that everyone could see plain and simple, how much better the Zenfone 3 Zoom performed. It’s shocking and I’m not exaggerating! More than 4 hours longer video playback on the Zenfone 3 Zoom vs. iPhone 7 Plus. This is the biggest take away. All the other results are big, but they aren’t as dramatic as the video playback test. It’s actually a bit mind boggling. The Zenfone 3 Zoom is half the price of the iPhone 7 Plus on top of the battery advantages.